Powers: As a next generation super soldier she was granted Metallic/Granite type skin just below a thin layer of outer epidermis. This grants her resistance to injury, superhuman strength, apparent immunity from pain, a regenerative healing Factor and dramatically slowed aging. Her real name is unknown as is her past before she became a test subject in the S.C.A.R.s project founded by General Sam Ryan, Dr. Young Soo Pock, and J. Jonah Jameson. As a potential new super soldier she and Ballistique were given cybernetic upgrades to grant them superpowers, unfortunately a side effect was mental instability. On test missions they relished killing and as a result went outside protocol becoming mercenaries to indulge their homicidal tendencies [X-Factor #219]. Deemed a failure her memories were wiped and they became civilians [X-Factor #210, #216]. She lived as nurse Cocoa for many years before Ballistique regained her memories and attacked her with a flamethrower which revealed her metallic epidermis once she was set ablaze. 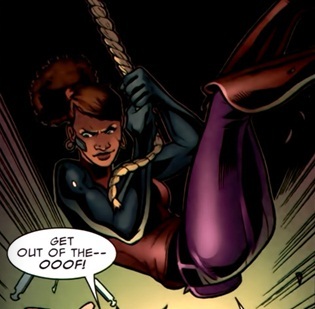 This caused her to regain her memories and the two journeyed to New York to kill mayor J. Jonah Jameson [X-Factor #216]. Together they were joined by another test subject Sylvius. They attempted to assassinate Jameson [X-Factor #219] and Pock [X-Factor #218] but were unsuccessful thanks to X-Factor Investigations and Black Cat. During a fight in which she took down the cat she noted “She had the Sweetest little rump” suggesting she was either Gay of Bisexual [X-factor #217]. their escape Ballistique was mind wiped by Monet but Rococo and Sylvius escaped [X-Factor #219]. ← New Images From Thor: The Dark World Emerge!